CSEP PAR Q - What is the Physical Activity Readiness Questionnaire? CSEP PAR-Q stands for the © Physical Activity Readiness Questionnaire created by the Canadian Society for Exercise Physiology. This is why it is called the CSEP PAR-Q. What does the csep par q physical activity readiness questionnaire achieve? The purpose of the CSEP PAR-Q is to identify individuals who require further medical evaluation before starting an exercise prescription. Therefore, the CSEP PAR-Q serves as an excellent health screening questionnaire. As a result, the CSEP PAR-Q is typically used by a qualified exercise professional certified as a personal trainer by ACSM (American College of Sports Medicine) and NASM (National Academy of Sports Medicine). Now that we know the CSEP PAR Q definition, let's take a look at the verbiage of an actual CSEP PAR-Q. If you are planning to become much more physically active than you are now, start by answering the seven questions in the box below. If you are between the ages of 15 and 69, the CSEP PAR-Q will tell you if you should check with your doctor before you start. If you are over 69 years of age, and you are not used to being very active, check with your doctor. Common sense is your best guide when you answer these questions. Please read the questions carefully and answer each one honestly: YES or NO. Talk with your doctor by phone or in person BEFORE you start becoming much more physically active or BEFORE you have a fitness appraisal ( a fitness assessment ). Tell your doctor about the CSEP PAR-Q and which questions you answered YES. take part in a fitness appraisal ( a fitness assessment ) – this is an excellent way to determine your basic fitness so that you can plan the best way for you to live actively. It is also highly recommended that you have your blood pressure evaluated. If your reading is over 144/94, talk with your doctor before you start becoming much more physically active. if you are not feeling well because of a temporary illness such as a cold or a fever – wait until you feel better; or if you are or may be pregnant – talk to your doctor before you start becoming more active. If your health changes so that you answer YES to any of the above CSEP PAR-Q questions, tell your fitness or health professional. Ask whether you should change your physical activity plan. The Canadian Society for Exercise Physiology Health Canada, and their agents assume no liability for persons who undertake physical activity. And, if in doubt after completing this physical activity readiness questionnaire, consult your doctor prior to physical activity. No Changes Permitted. You are encouraged to photocopy the CSEP PAR-Q but only if you use the entire form. NOTE: If the PAR-Q is being given to a person before he or she participates in a physical activity program or a fitness appraisal ( fitness assessment ), this section may be used for legal or administrative purposes. *age of majority where a person is considered to have reached adulthood and can now give legal consent is 18 in most countries. Check with your local or state authorities. 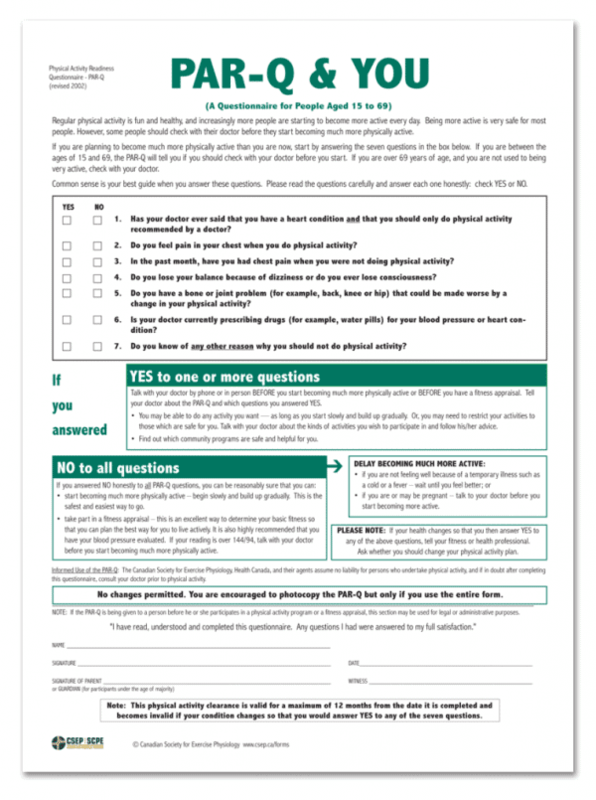 Note: This CSEP PAR-Q physical activity readiness questionnaire clearance is valid for a maximum of 12 months from the date it is completed and becomes invalid if your condition changes so that you would answer YES to any of the seven question. You can download a free CSEP PAR Q printable questionnaire template here.